Monon 32, GM Open House, McCook Illinois, September 17, 1989. In the late 1940’s when the pressure was put on GM to produce more than E’s and F’s and beefed up switcher/transfer units, to compete against the likes of ALCo, this – the BL-1– was General Motor’s response. While the BL-1 or Branch Line 1,was designed for freight and line haul switching, it had some fatal flaws. Most notably the lack of a full-length exterior walkway that proved awkward in switching operations. On the plus side, it was stylish with great visibility provided by the tapered car body. But then the stylish tapered car body proved to be expensive to manufacture. So the project was doomed from the get-go! BL-1 was the demonstrator, only one built. From that model, a total of 58 BL-2’s were built for nine roads including Monon – sometimes referred to as the “University Railroad.” If you don’t know that much about the Monon, take a moment to read the link I’ve provided – a most interesting railroad! I saw Western Maryland’s BL-2 Number 82 when my late wife and I were on our honeymoon at Cass West Virginia in 1989. Since then Western Maryland has been spruced up, and relocated to live operations over the West Virginia Central. 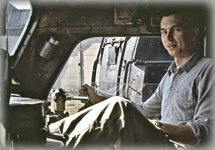 If you live in that area, I’d love to see operating photos, as well as engine room and cab shots! Remarkably, five BL-2’s were preserved and you can take a ride on WVC’s 82, via this link to U-Tube! 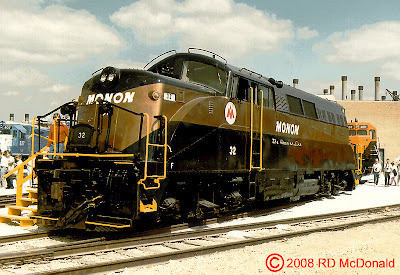 Railroad Stuff: Monon 32, GM Branch Line – 2, V-16 567B 1,500 hp, naturally aspirated. Built GMD 1948, serial number 5243. On display at the Kentucky Railway Museum.